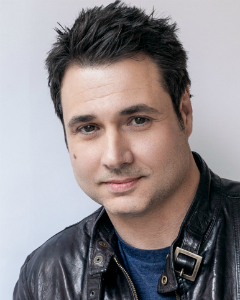 Adam Ferrara, the stand-up comedian and actor who Entertainment Weekly dubbed “hilarious,” proudly played Chief Needles Nelson on the Emmy® nominated FX drama Rescue Me. He has also costarred alongside Kevin James in the hit movie Paul Blart: Mall Cop and in Definitely Maybe with Ryan Reynolds and Isla Fisher. Besides hosting the critically acclaimed BBC sensation, Top Gear US, airing on HISTORY, Adam is an internationally touring headliner. Additionally, Adam is currently shooting a co-starring role on Showtime’s hit series Nurse Jackie opposite Edie Falco. A two-time nominee for best male stand-up by the American Comedy Awards, Ferrara appears on numerous TV shows, including The Tonight Show With Jay Leno, Late Show With David Letterman, Late Night With Jimmy Fallon, The View and Rachael Ray. Adam’s third comedy special is entitled Funny as Hell where he brings the stage to life with his honest, clever and fearless perspective on family, relationships and himself.